Experience a wide array of the freshest juices, including detox juice, green juice, even nightcaps. They're all in The Juice Lover's Big Book of Juices. Try as we might, it can be difficult to fit in the recommended six to eight servings of fruit and vegetables every day. Juicing makes it easy! Filled with 425 recipes, The Juice Lover's Big Book of Juices is the ultimate juicing resource for those looking to boost their nutrition. 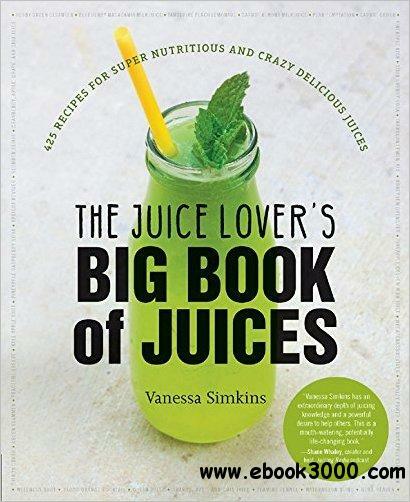 Author and juicing expert Vanessa Simkins provides you with fresh, raw recipes you can juice everyday. Accessible to both experienced juicers and those looking to get started, The Juice Lover's Big Book of Juices is packed with fun, colorful photos and information on the preventative and curative health benefits of juicing. In addition to lots of recipes for detox juices and green juices, you'll find recipes using ingredients hard to find in other juicing books, such as nut milks and chia, as well as newer juicing trends, like juice shots and nightcap juices. Drink up! The Big Book of Bread Machine Recipes: Includes Over 600 Recipes!